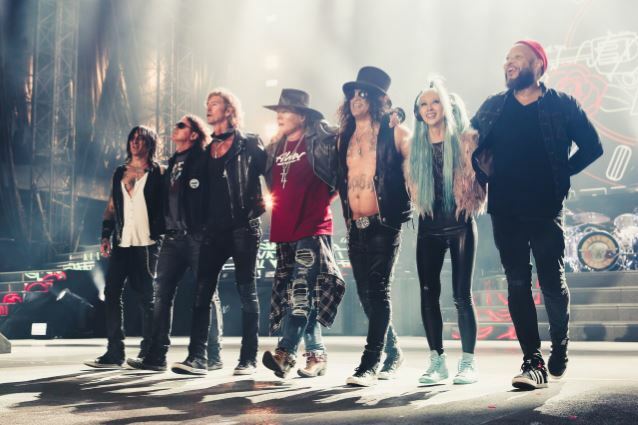 GUNS N’ ROSES will electrify fans into the fall, announcing today a series of fifteen additional North American Stadium and Arena stops on their ongoing worldwide “Not In This Lifetime” tour. Produced by Live Nation, the exhilarating global phenomenon is letting fans get closer with a newly added round of arena shows throughout the U.S. and Canada including stops at New York’s famed Madison Square Garden and Los Angeles’s Forum and Staples Center over Thanksgiving weekend. In addition to the arena shows, a larger-than-life performance for the people of Little Rock, Arkansas has been added on August 5 at War Memorial Stadium. Tickets for the new Stadium and Arena dates go on sale to the general public starting Saturday, June 3. Exclusive GUNS N’ ROSES VIP packages available for North American dates at vipnation.com. Special guests for the colossal stadium shows have also been revealed including ZZ TOP on the El Paso, Texas and San Antonio, Texas dates; DEFTONES on the St. Louis, Missouri and Minneapolis, Minnesota dates; Sturgill Simpson on the Denver, Colorado, Little Rock, Arkansas, and Miami, Florida dates; ROYAL BLOOD on the Vancouver, British Columbia and George, Wasshington dates; LĪVE on the Winston-Salem, North Carolina and Hershey, Pennsylvania dates; and OUR LADY PEACE on the Montreal, Quebec, Ottawa, Ontario, Winnipeg, Manitoba, and Edmonton, Alberta dates. AVENGED SEVENFOLD frontman M. Shadows has confirmed to Kaytie of the Razor 94.7 radio station that the band will embark on a full North American headlining tour in January and February 2018. The trek, which will be announced after the completion of AVENGED‘s current stadium run as the support act for METALLICA, was originally “supposed to happen this summer until we got that call from METALLICA, so we decided to put it on hold,” the singer explained. Cirque Du Soleil is currently the world’s biggest theatrical producer, bringing its unique modern take on the circus concept to more than 90 million people in 271 cities around the world. This marks the first time that the company has collaborated with a touring rock band. 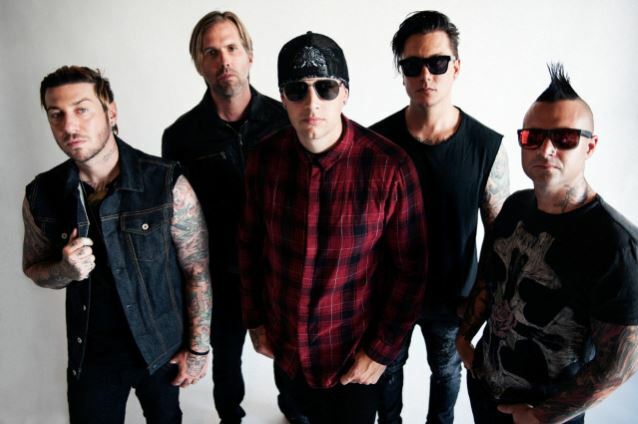 AVENGED SEVENFOLD is touring in support of its seventh album, “The Stage”, which was released at the end of October with almost no promotion beforehand. Extreme metallers ARCH ENEMY will release their tenth studio album, “Will To Power”, on September 8 via Century Media Records. 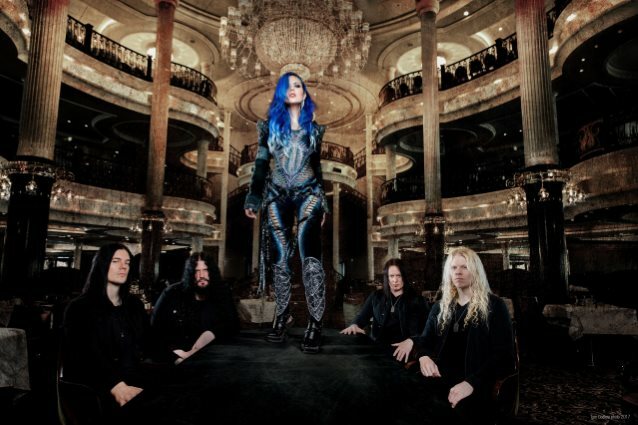 “Will To Power” will mark the second ARCH ENEMY album since the departure of longtime singer Angela Gossow and addition of her replacement, former THE AGONIST frontwoman Alissa White-Gluz. It will also be the first ARCH ENEMY disc to feature guitarist Jeff Loomis (ex-NEVERMORE), who joined the band in late 2014. Amott told Rock Hard magazine in January that Loomis — who was the main songwriter in his former band NEVERMORE — has not contributed to the songwriting on the group’s new disc. ARCH ENEMY‘s “As The Stages Burn!” DVD was released on March 31 via Century Media. The set contains video footage of the band’s largest stage production to date from their performance last summer at the Wacken Open Air festival in Wacken, Germany. 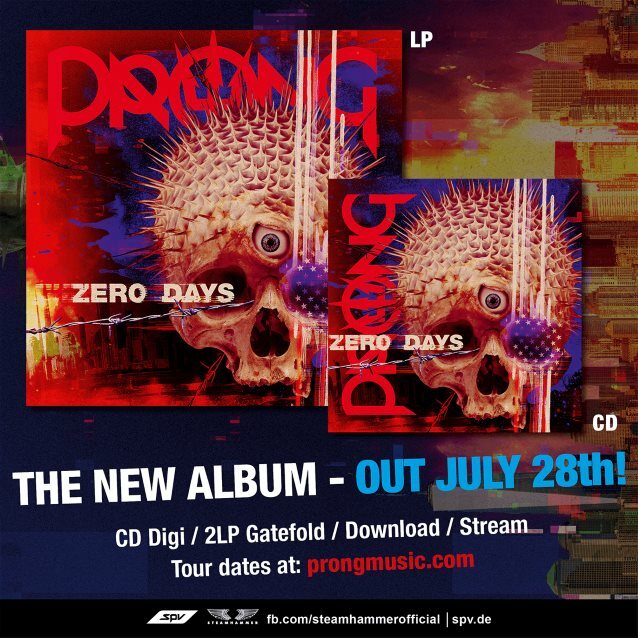 PRONG will release its new album, “Zero Days”, on July 28 via Steamhammer/SPV as a CD digipak, 2LP gatefold, digital download and as a stream. 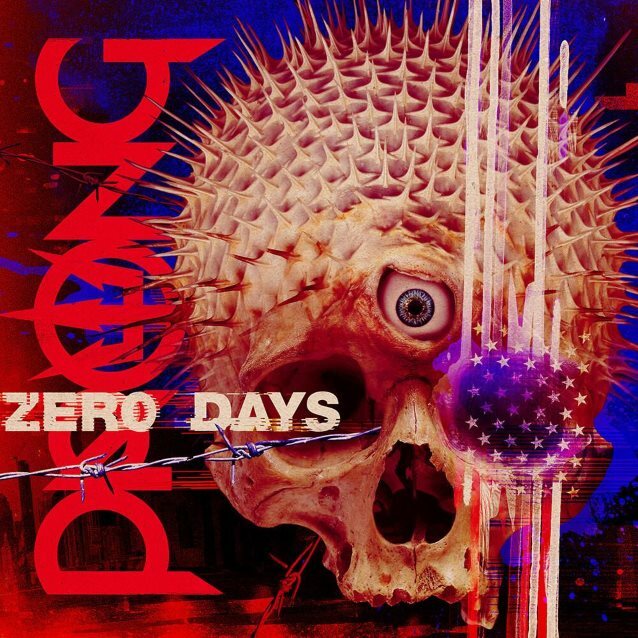 Musically, “Zero Days” hits home from the first bars of the mighty opener “However It May End” to the last bars of the album’s closing track, “Wasting Of The Dawn”. Every track is its own emotional roller-coaster ride, chock-full of massive riffage, ironclad grooves and topped off by Victor‘s ever-improving vocal delivery. Victor states about “Zero Days”: “I must say a lot of effort was put into this new ‘Zero Days’ recording. From the minute I would get off tour, I would consolidate ideas from the road and form new ones. Again the focus was on creating good songs. We wanted this record to be modern as well as holding justice to all the previous releases. Again, and maybe even more than normally, I went crazy meticulous with the lyrics. I had built up a lot to say and I wanted to articulate them in the most intelligent way possible.I firmly believe the mission was accomplished all around. 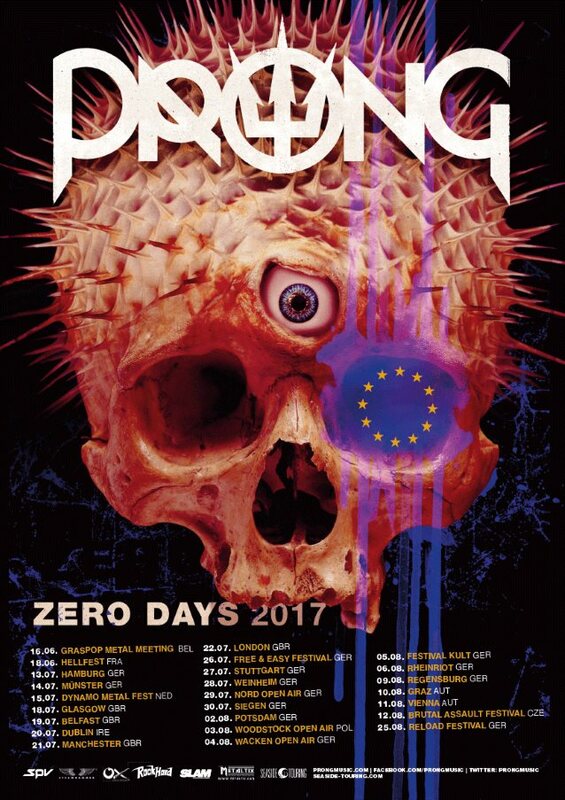 PRONG has also announced the 2017 European “Zero Days” summer tour, featuring some of the most coveted festivals as well as a run of headline shows. 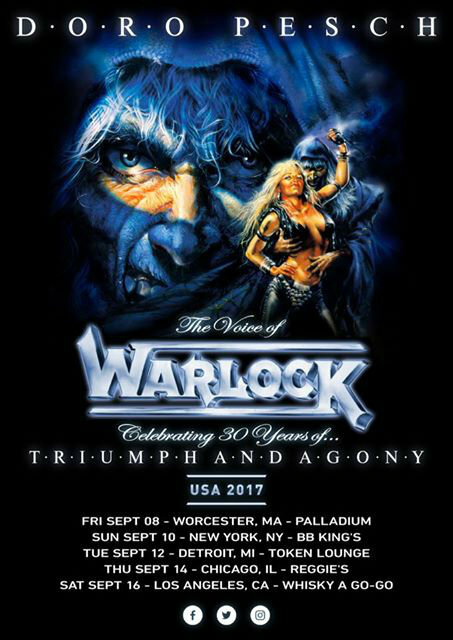 German metal queen Doro Pesch will celebrate the thirtieth anniversary of WARLOCK‘s “Triumph And Agony” album on a short U.S. tour in September. Doro‘s last release was a package titled “Strong And Proud – 30 Years Of Rock And Metal”, which came out in June 2016 via Nuclear Blast. It contained three decades of Doro — three unforgettable nights — forever captured on three DVDs and two Blu-rays, including a two-hour-plus music movie. 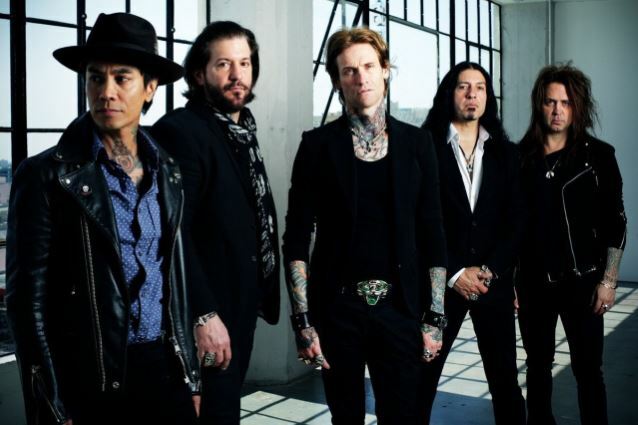 California rockers BUCKCHERRY have parted ways with guitarist Keith Nelson and drummer Xavier Muriel. Replacing them on the band’s summer tour dates will be Kevin Roentgen and Sean Winchester (EVERCLEAR), respectively. The news of Nelson and Muriel‘s exit from BUCKCHERRY was confirmed by the band’s guitarist Stevie D., who recently launched a new group called JOSH TODD & THE CONFLICT with BUCKCHERRY singer Josh Todd. Stevie wrote in a statement: “As most of you may already know, Josh and I have just completed the debut album from our other band, JOSH TODD & THE CONFLICT, which is set to drop in September. We look forward to seeing all of you on the road very soon — keep your eyes peeled for upcoming dates, we’ll be adding them shortly. And, as most of you may already also know, BUCKCHERRY has recently gone through some big changes. “As we wish the very best for Keith and Xavier in all of their future endeavors, we want you to be the first to know that we’ll be showing up in a huge way for all the BUCKCHERRY dates this summer with the help of a couple of our dearest friends, Kevin Roentgen and Sean Winchester. The digital deluxe edition release of BUCKCHERRY‘s album “Rock ‘N’ Roll”, was made available in January 2016 via F-Bomb/Caroline. The new deluxe edition featured the record’s original track list as well as the newly released version of “The Feeling Never Dies”, a brand new song titled “Getting Started” and a B-side called “Cannonball”. INVIDIA, the new band featuring former and current members of FIVE FINGER DEATH PUNCH and SKINLAB, has officially announced the addition of Evan Seidlitz as the newest member of the band, replacing vocalist Travis Johnson on the upcoming “Screaming Black Curse” tour with ALL HAIL THE YETI and supporting act BROKEN RAIL. Seidlitz is no stranger to the frontman spotlight, known for his work in VYCES, THROWN INTO EXILE and GRIMACE. Though Johnson is leaving to fully invest in his role as bassist of IN THIS MOMENT, the band is very excited to begin this new journey with Seidlitz and has no doubts that fans will be pleased with what he has to bring to the table. When asked about Johnson‘s departure, INVIDIA stated: “We respect Travis‘s choice to honor his commitment to IN THIS MOMENT but it left us in a tough spot. It’s hard for us as well — Travis is family and is part of the INVIDIA story. “We are beyond happy that Evan was interested and fits in so well in the INVIDIA camp. He’s a guy we all know well and the band as well as the fans are in great hands. Johnson added: “It was a really tough choice for me to step back from fronting INVIDIA. I love singing and am so proud of ‘As the Sun Sleeps’. INVIDIA is family to me. I mean, I just can’t be in two places at the same time and I had to honor my commitment to IN THIS MOMENT. “I can’t imagine a better fit than Evan. It was actually a suggestion I had brought up to the band. “I truly hope all of the IN THIS MOMENT fans who have supported INVIDIA welcome him to the band. Seidlitz said: “When Matt Snell called me up and asked me to join INVIDIA full-time, I didn’t have to think very long about it before I said, ‘Yeah, let’s do it.’ I knew I could no longer keep a commitment with VYCES. “The guys in VYCES as well as Travis have been nothing but supportive in my decision. The tour will begin on May 17 in Los Angeles at the Whisky A Go Go and wrap up on June 4 in Fullerton, California. INVIDIA‘s debut album, “As The Sun Sleeps”, was released on March 31 via SPV.